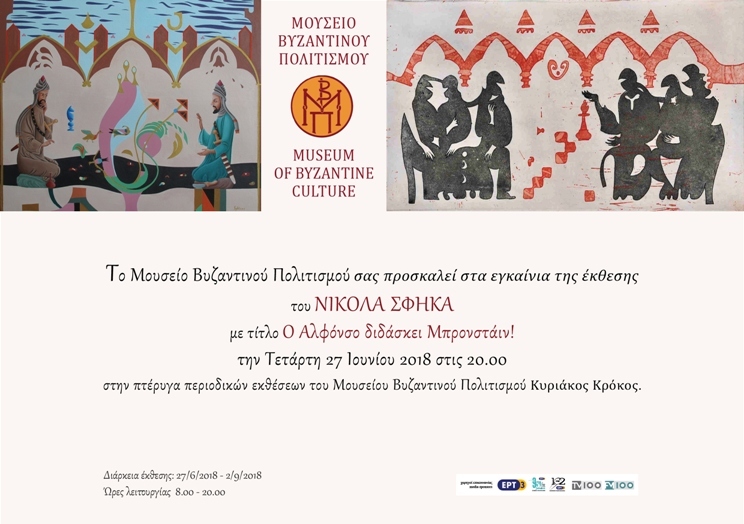 Opening of the temporary exhibition “Alphonso teaches Bronstein!” at the Museum of Byzantine Culture, on Wednesday 27 June 2018, at 20.00. The artist is inspired by the medieval figures of the “Book of Games” (Libro de ajedrez, dados, y tablas, 1283) by Alphonso X called the Wise (1221-1284), King of Castile and Leon. The abstract figures are mobilized so as to illustrate the “King’s Indian opening”. It is an opening studied by David Bronstein, a leading chess player of 20th century, which influenced even world chess champions. In the world of Nicolas Sphicas the medieval figures, whose garments reflect the stylish Northern gothic styles, are depicted analyzing the modern chess theory. The games are sometimes accompanied by music; however, the main issue that is presented is mostly Alphonso’s way of thinking: the elevation of the game as means that abolishes the differences between different races, religions and dogmas. An art happening titled “Friend games between two chess players” is going to be presented at the opening of the exhibition. Nicolas Sphicas has studied at the Faculty of Fine Arts of the Helwan University of Cairo and he obtained his PhD degree from the Aristotle University of Thessaloniki, School of Fine Arts, Department of Visual and Applied Arts. He has shown his work in 25 solo and many group exhibitions. His name is included in several dictionaries and encyclopedias. Many of his works are found in private collections and Art Galleries. An artistic trend which uses as a central concept the movement during a chess game. The term derives from Retro, meaning Return and Shah, meaning King, at this particular case the King of the chessboard. The term has been used by Nicolas Sphicas in 1993 to describe his painted works which express the sentiments that the metaphysical world of movement on the chessboard poses. The works proceed through an intuitive understanding of the game or through a position of the problem and represent the spiritual and intellectual energy which accumulates through the moves of the pieces about the chessboard.